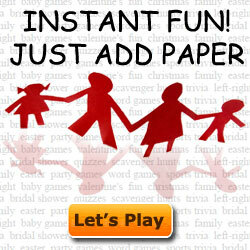 "Printable birthday games are the solution for any party! The problem? It's hard to find fun games for birthday parties! We’ve come up with an easy way to entertain your guests and get everyone having a good time. Welcome Printable Games! How it works is easy! Browse through tons of fun printable birthday party games. Find one you like, and for great value, print them at home from your own printer! Fun printable crossword puzzles, printable learning games, printable bingo games, pin the tail on the donkey and more! Fun at any age! Share Your Fun Party Games!